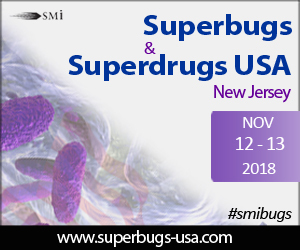 Building on almost two decades worth of expertise in fighting the growing threat of antimicrobial resistance (AMR), SMi Group is pleased to announce the release of the official agenda for the 3rd annual Superbugs & Superdrugs USA Conference, which is due to take place in Iselin, New Jersey on November 12 – 13, 2018. Antimicrobial resistance, leading to the development of superbugs, is a major threat to public health and continues to increase as a problem, due to continued misuse of antibiotics. With pharmaceutical companies showing less focus on the development of new antibiotics, several incentive initiatives have been set up – CARBX, BARDA, IMI (EU) – in order to encourage reinvestments. From a governmental point of view, the challenge lies in encouraging companies to develop new antimicrobial drugs and to strengthen and maintain the pipeline of antibiotics and other antimicrobials currently being developed. This years’ Superbugs & Superdrugs USA Conference programme will help participants to learn about pathogen focused drug development; discover the best methods to overcome bacterial resistance through novel modes of action; discuss the state of developments within the antifungal space; develop an understanding of funding opportunities which support antibacterial research and development; gain insight into new techniques through case-study examples of rapid diagnostic methods currently being used within the field, making this event the perfect platform to strengthen knowledge in key principles.